Micro irrigation is an efficient, low pressure irrigation method which applies water slowly and directly to the root zone. The water is applied over a larger area than drip irrigation allowing for roots to spread out. 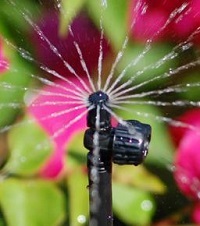 Many different varieties of micro sprinklers are utilised to apply water evenly over an area. Micro irrigation systems can be precisely controlled, allowing the user to only distribute the quantity of water or fertilizer that plants actually need to consume. Micro irrigation is also commonly used for climate control. Water Dynamics can assist with all aspects of your micro irrigation system including the control station, pump, filter, valve, flowmeter, backflow prevention system, chemical injection system for fertilisers and the supply of chemicals. We can design complete solutions or supply individual components. Contact us today on 1800 571 812 to discuss your micro irrigation requirements.